I spent a semester at Accent Français and it was a great experience. I learned so much from the teachers and the coursework. My French language skills improved dramatically by the end of the program. Would definitely recommend!! My experience at Accent Français was excellent! The courses were very well organized and included an appropriate amount of work. I learned a lot from my Oral and Written Expression and Methodology courses, and I felt prepared for the DFP exam from my Professional French course. The professors were really engaged and effective. The excursions and tour guides were also wonderful--I went to Arles, Les Baux-de-Provence, and Sommières. Above all, I improved my French a lot. I would highly recommend coming here to study! Hello Claire, We are glad that your French course at Accent Français was a part of the great time you’ve had in Montpellier. We hope we will see you again! A très bientôt ! I fully recommend this school. From beginning to end it was well organised. All staff were positive and helpful. Each week had specific objectives and I enjoyed seeing my progression throughout the time I was there. Two teachers daily, teaching different topics, helped keep the class fresh and motivated. Thanks Accent Français! I was really pleasantly surprised by the quality and content of the courses and how conducive the atmosphere was to making friends. The teachers were incredibly friendly and made you feel comfortable to speak straight away, you could ask them anything and they would have class discussions about anything that interested you. I also appreciated how well your progression was recorded, there was a chart showing what lessons were coming up and the feedback was comprehensive and helpful. I could not recommend this school more, and this comes from someone who has done innumerable language classes in the past! We are delighted that you enjoyed your French course with us. Our teachers do their best to make their course enjoyable, structured and efficient for all levels. If you come back to the South of France, we will be more than happy to see you again ! I had a very enjoyable time at accent francais, the lessons were very helpful and interesting. we covered complicated grammar, and had many interesting conversations in french on all sorts of topics. the teachers were friendly and helpful! and the school is in a very practical location! The school accent francais from the beginning is very welcoming and organised! If you don't know something the staff are very helpful, as well as in the class, they are patient, informative and enthusiastic. Profesores altamente calificados. Diversos métodos de enseñanza, objetivos claros y definidos para cada nivel. Evaluaciones amenas. 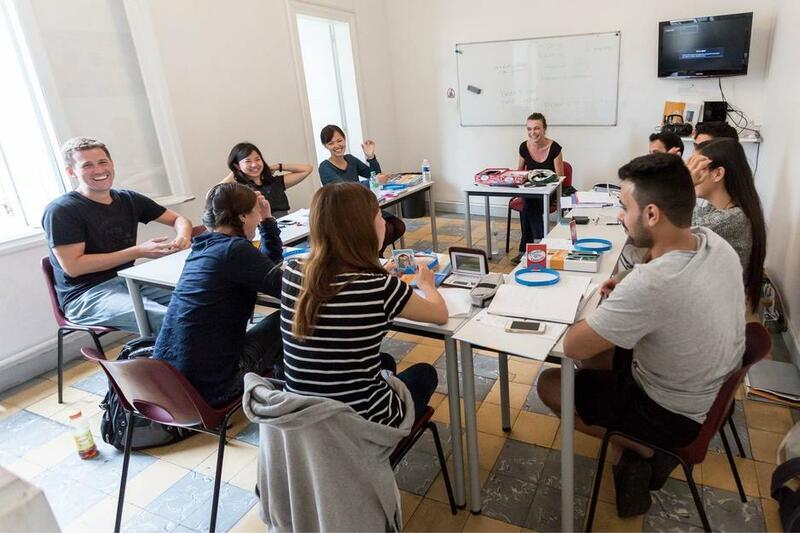 I spent four weeks at Accent Français in Montpellier and attended an Intensive Course, as well as a Preperation Course ot prepare myself well for the DALF C1 exam. Not only was it a pleasure to take lessons with the cordial teachers, but also their ability to motivate the students, to integrate many different nationalities and language levels and to create a diversified class was outstanding. What was striking as well, was the personal and dedicated advice that the teachers and the office employees gave. They really cared for me when I had problems or questions and were there for my concerns when I wished to switch from the Intensive Course to the DALF Preperation for the last two weeks. Throughout my entire stay I enjoyed every day that I would spent at school. I could watch myself progress quickly thanks to exigent tasks that came up to my language level and that were shaped specifically to suit my needs for the DALF exam. For people who wished to participate in activities, there was a different trip or activity organized every weekend, from which I attended the trip to Avignon with the incredible school's guide Jean-Paul, who is simply a real unicum to experience! I think back happily to my time in Montpellier and it just all went by too fast. This is one of the places that will amaze you, time and again, with its southern flair and laid back mentality, while supplying you with all the fun and demanding french skills you need, at Accent Français! I strongly recommend this language school if you are looking for a familiar atmosphere where you can get involved in the process and wish to attend classes with competent teachers who know what they do and are able to understand the students' needs. Side Note: The skills learned helped me to prepare and pass the DALF exam. I've had a French class as a beginner for a month in Accent Français. It was such a good experience in my life. The city is beautiful and safe. And the course was really fun and the teachers were really kind and patient. There were many school activities every day that I could choose such as tasting local food, cine club, and making French cousine. They also provide school excursions on the weekend to such as Arles and Marseille. I really enjoyed my time in Montpellier and I got to make lots of friends in Accent Français. There are so many students from all over the world from 16 to 60s and I was impressed and inspired their enthusiasm. I chose to stay in a student apartment which was spacious and clean; in a safe area and it took only 10 minutes by tram or 30minutes on foot. Many of the students stayed with French host families while I was there; and they told me they really enjoyed French cousine every evening. If I have a chance to learn French again, I will definitely come back to Accent Français in Montpellier.